Oof, it’s been a while, hasn’t it? I mean, the new year has been around long enough by now that I don’t even catch myself scrawling a 7 where there should be an 8. In retrospect I probably shouldn’t have left you with a tale of food poisoning before going AWOL, but worry not, the two have nothing to do with each other. What I should have done was hang a ‘closed for maintenance’ sign up here for the first couple weeks of January – not site maintenance, mind you, but self maintenance. Yes, it’s true: as much as I loathe the whole if-it’s-January-it-must-be-time-to-suffer bandwagon, it seems I never can resist buying a ticket and hopping on. I mean, every yin has its yang, right? And to counter our holiday yin, whose highlights this year included meter-long bratwursts, zwiebelkuchen, glühwein, raclette, fondue, daily breakfasts of croissants piled high with every kind of meat, cheese and jam under the sun, mid-afternoon trysts with coffee and cake, and near-nightly ‘snacks’ of Turkish lahmacun and döner kebabs in the early hours after yet another alcohol-fueled reunion with long-lost friends, there now exists a drastic need for some yang. I haven’t even mustered the courage to step on the scale yet, though in light of the howls of despair that emanated from the bathroom when Manuel did, I think that’s probably for the best. But as dire as the situation may be, there’s a certain four-letter word beginning with ‘D’ you’ll never hear uttered around here. For one thing, it makes my palms all sweaty. For another, I’ve tried plenty of those ‘D’s and have come to the conclusion that they’re all designed to function as endless vicious cycles: deny, suffer, relent, panic, deny, suffer, relent. Instead, what I try to do in January is clean up my lifestyle a little bit, you know in a less-of-the-bad-stuff and more-of-the-good kind of way, and most importantly, do it in a way that doesn’t leave me entirely miserable. After all, January is cold and miserable enough without having to contemplate things like Equal®-speckled grapefruit halves and fat-free salad dressing (though let’s face it, I would rather gouge my eyes out with a spork than find either of those on my plate at any time of year! ), so I know if that if the new, healthier me is going to stand a chance of making it past February, what I eat had better be satisfying. And preferably, hot and filling. And that’s where soup comes in. Since soup, at its purest, need be nothing more than a simple, well-seasoned puree of vegetables, it is perfect self-improvement fare. Slurp down a bowl at the start of every meal and I swear, no matter what else you’re eating you’ll never feel deprived. Of course I’m also happy making soup the main event, but for this role I prefer something a bit heartier. Some meat perhaps, and something starchy, and of course it needs to be full of strong, punchy flavors. Pretty much exactly what you’ll find in this soup, a fantastic recipe from one of my treasured Moro cookbooks. An inspired (and quite likely invented, but don’t quote me on that) juxtaposition of Spanish ingredients, the flavors work together beautifully; the chorizo gives it just the right smoky depth, the chestnuts add body and a gentle sweetness, and saffron and chili tickle your tastebuds and warm you from the inside out. It was filling, scrumptious, and remarkably healthy too, particularly after I impulsively chucked in a few handfuls of chopped leafy greens. You know, anything to make myself believe that I’m really taking this whole clean-living thing seriously. Which, on days when there’s soup like this on the menu, isn’t actually all that hard to do. p.s. For more easy-peasy soup ideas, check out this ancient post of mine. I still swear by the method! p.p.s. Hooray for us – we raised $91,188.00 in December’s Menu for Hope!!! Thanks to each and every one of you who helped make it success, and congratulations to Shuna, lucky winner of the Moro Cookbook trilogy! Did you know chestnuts have the least fat of any nut at only 10%, and that nutritionally they resemble brown rice? Yup, who knew they were perfect January food? Around here, January is actually a great time to buy chestnuts because they’re often marked down post-Christmas; I often buy several packages of the vacuum-packed kind to use in all kinds of things over the coming months. If you can only find fresh chestnuts, however, and don’t mind going through the whole cooking and peeling rigamarole, by all means feel free, but in all honesty, I don’t know if I would bother. Instead I might substitute a mixture of, say, cubed sweet potato and butter beans. It wouldn’t be quite the same, of course, but I daresay it would capture the spirit pretty well. Oh, and I suppose you’re wondering what’s up with the quantities for the chorizo. Well, the original recipe calls for only a quarter-pound, but in a moment of reckless abandon (and ’cause I luuuvz it so much) I threw in twice that amount. Living dangerously, don’t I know it! In a large, heavy pot, heat the oil over a medium heat. Add the onion, carrot, celery, chorizo and a generous pinch of salt and fry gently for about 20 minutes, stirring occasionally until the whole thing caramelizes and turns a fragrant golden brown. Now, add the garlic, cumin, thyme and chilli and cook for a minute more, then add the tomato and, after a couple more minutes, the chestnuts. Give everything a good stir and then add the saffron, water, and chard or kale if using, and simmer for about 20 minutes, until everything is soft. Remove the pot from the heat and with a potato masher, gently mash until the chestnuts have broken down and the soup seems quite thick. Season with salt and pepper and serve hot with whole-grain bread. I have to smile at myself, and your cute story, because when I first read your allusion to the D word, I actually had to think hard to guess what it was.Soups, this one and many others, sound wonderful! I’ve tried this recipe and loved it! Happy 2008! Just wanted to respond because I enjoy reading your stuff so much. The food of course is fantastic, and so appropriate as I read this eating my lunch of squash soup! Last night, my husband and I made the "Salad, simply" recipe we found here – I don’t think I will ever pour salad dressing on my salads again, was such a simple change, but very nice and fresh. I can’t wait to try more!!Thanks!! Soups are my comfort food and I love chestnuts – will definitely try this delicious recipe! Wow, who would have though chesnuts and chorizo…but it sounds and looks delish. That sounds lovely. I just made a pork roast with chestnuts, and it was also very warming and winter-relieving. Chestnuts are a favorite flavor of mine, though they can be a beast to roast and shell. Have you ever tried dried chestnuts? They are cheaper than the fancy canned ones, and much easier than roasting/peeling business, which always seems to result in nasty shell bits under my fingernails. (I’m probably not doing it properly. )The dried ones seem to work particularly well in soups, where they have plenty of time to rehydrate. Around here- I can only find them in Italian shops, around the winter holidays. Just like you, I find myself craving chunky soups this month when I am normally a velouté person. I can’t wait to try this one! Made the soup base last night with the soffritto (frist paragraph to second paragraph up to adding the tomatoes). Used chicken chorizo (found at Trader Joe’s) without the casing & a pinch of smoked paprika plus red pepper flakes. Salted it along the way per Alice Water’s soup making instruction. Added the kale and the roasted chestnuts this morning. Had a bowl of it before noon served with homemade 70% whole rye bread with flax seeds and sunflower seeds. De.li.ci.ous. I love chestnuts to begin with so this soup is what I have been longing for. Eating while viewing a snowy Sierra Valley. What could be better than a hearty bowl of soup in this wintery weather?I had some earl grey tea with the meal. The tea had a lingering sweet taste prob. due to the chestnut sweetness. Will try to snap a photo and post it on my flickr album.Thanks very much, Melisa. ps: Your photos and writing are exquisite as always! What an amazing flavor combination! This sounds like a great winter soup to warm up! for anyone in the uk Tesco currently have jars of chestnuts reduced to clear their Xmas stock. Must go back and get more as the chorizo and chestnut soup will definitely be made again. I used cavolo nero too instead of kale. Deelish and b….. the D…! Melissa: The dried are much, much cheaper than the canned, I forgot to mention that! Very good for long cooked items with lots of liquid, so they get totally softened up. And, being dried, they keep forever. Next christmas, I’m going to buy a lot more, and keep them in a glass jar for the rest of the year. wonderful dish, eally great balance. The med in a bowl. Melissa, I love your site! Your photos and recipes are fantastic and I always look forward to seeing what you’ll write next. Thanks for sharing your kitchen with the rest of us across the world…even if it only furthers my food obsession and waistline! 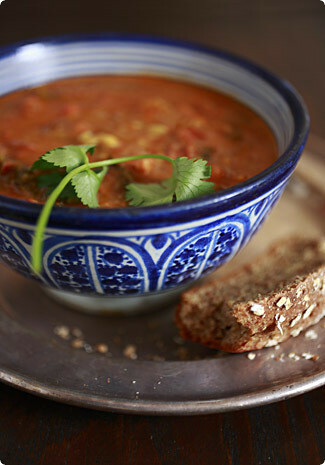 Your chorizo and chestnut soup looks fantastic and we’ll definitely give it a try! Cheers to you! I have come across your blog today, having found it on Cupcake Project. I have now spent 3 hours looking through the recipes(I like food, alot! ), and through your journals. Your writing is wonderfully warm and funny, and all of the food looks delicious! This soup has been my favourite one so far, and i am definitely going to make it!